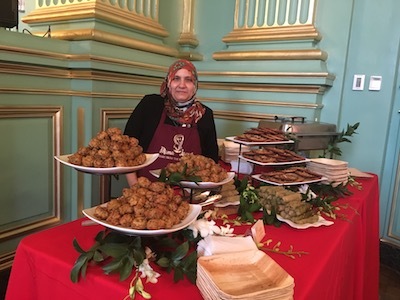 Mama Lamees cuisine is a catering business located in San Francisco, CA. Serving homemade, authentic, and fresh Middle Eastern food that is made from scratch, Mama Lamees cuisine is a feast from the Middle East! Lamees’ cooking expertise originates from her mother’s kitchen, where she began cooking at the age of 10. As an employee of the United Nations Relief and Works Agency, Lamees has lived in various Middle Eastern countries. This experience has contributed greatly to her culinary skills as she has learned something new about the cuisine in each place she has visited. Today, she blends these experiences through all the flavors which create her delicious, authentic and unique Middle Eastern dishes.